Yay! It’s sale time, starting tomorrow. 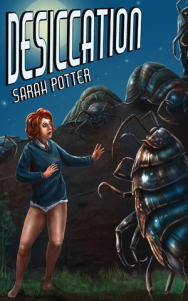 And I’m going for one increment, which means that for six days, from March 2 – 8. the Kindle version of my YA science fiction/urban fantasy novel, Desiccation, will be on sale on amazon.com and amazon.co.uk at $1.37/£0.99. Whilst posting, I’d like to say a huge thank you to those of you who entered the recent Goodreads Giveaway to win a paperback copy of Desiccation. A whopping 1,005 people entered this draw, about 380 added it to their too-read shelves, and the lucky winner came from the US. Tweeted this, tho’ it doesn’t seem to be showing up in your stats, Sarah. Wishing you many more sales! It might be good if you could sched an auto tweet, say for Australian and Kiwi readers. I know I’m on opposite side of world to them, and not usually up late enough to communicate with those in the “far East” or Oceania. I’d also humbly suggest looking up some hashtags that appeal to frugal bookbuyers. Not sure what those are right now, though, sorry. Thanks, Leigh 🙂 Which stats are you talking about? The deal is only on Amazon’s UK and US sites, so the Aussies and Kiwis might get a bit frustrated by such tweets! That’s a good idea about the hashtags. Aha. I see. I figured the deal was for any English-speakers who navigated to Amazon. My bad. I’m just looking at the buttons at the bottom of your post, and I clicked on Twitter to send my tweet (and thought it tweeted properly, but maybe I should re-check my stream from yesterday), but it’s not recording you as having had any tweets (again, next to or superimposed on the “tweet” button at the bottom of your post). Hope this makes sense! Yeah, you might also just say “please RT” and tweet it out again once or twice a day (or auto-schedule it. I don’t use any tweeting platform, so I can’t recommend there). Anyway, good luck!